Researchers at the Hungarian Academy of Sciences have recently discovered new benefits for naturally occurring compounds, called echinacosides in Echinacea. Although well-known for its support of immune system activity, clinical studies have found that certain echinacosides can significantly reduce feelings of anxiety and tension. 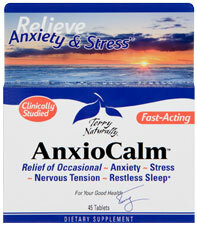 The specific type and ratio of Echinacea compounds in AnxioCalm are not found in any other Echinacea product. EuroPharma has exclusive rights to this unique extract for North America. The clinically studied dose was 20 mg. Taking more than 20 mg per dose was proven ineffective.